Forecasting The Future – What If? How does each Generation Source Compare? The electrical grid is a system that connects where the electricity is generated (generation) to the point where the electricity is used (load). Electrical generators can be located hundreds of kilometers from the load that they supply. It is therefore necessary to move large quantities of electricity over long distances. Substation: After the electricity is generated it is transformed from lower voltages to higher voltages for long distance transmission. In the Yukon, mines connect directly to the transmission system via a substation. Transmission: The substation feeds the electricity onto transmission lines for long distance transport. Transmission lines transport the electricity most of the distance from the generator to the load. Substation: Close to the loads (i.e. electricity user), substations convert the electricity from a high transmission voltage to a lower distribution voltage. 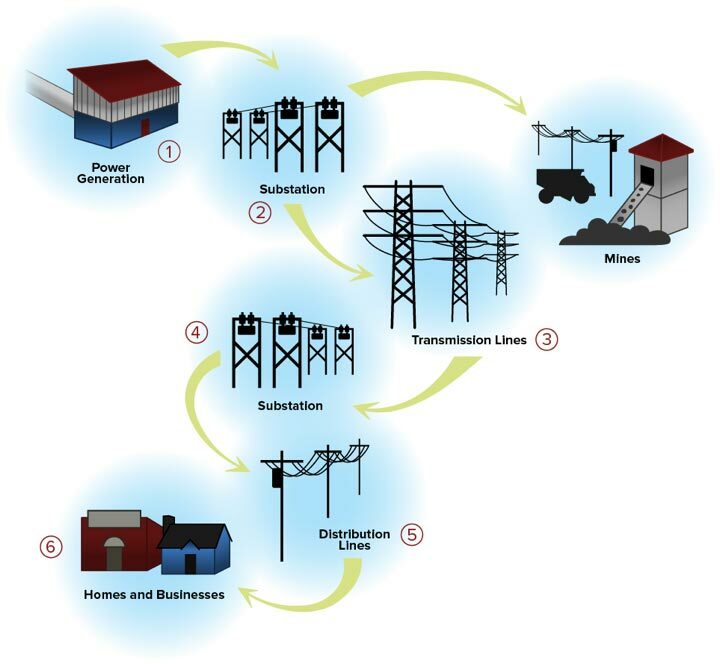 Distribution: The electricity is transported along distribution lines for the final delivery to the load (i.e. end user). Distribution lines are much smaller and operate at a lower voltage than transmission lines but higher voltages than your home. Distribution systems are the networks of wooden poles found in cities and towns that run down residential roads and ultimately connect electricity to homes and businesses. On the power pole closest to the end user, the electricity is converted to an even lower voltage (i.e. 120 volts AC) for use in homes and small businesses. Load: The end user (e.g. homes, businesses, mines, etc.) receives electricity from the distribution system and uses the electricity to supply their electricity.